Over the past 7 weeks we have hosted a fantastic summer holiday programme for young people, particularly for our young parents and their children. Each Friday we organised exciting new activities that we believed would create that classic delightful summer holiday feel. We kicked the first week off with a big game of Rounder at Graham’s Point in Kilmun which was enjoyed along with a lovely picnic. 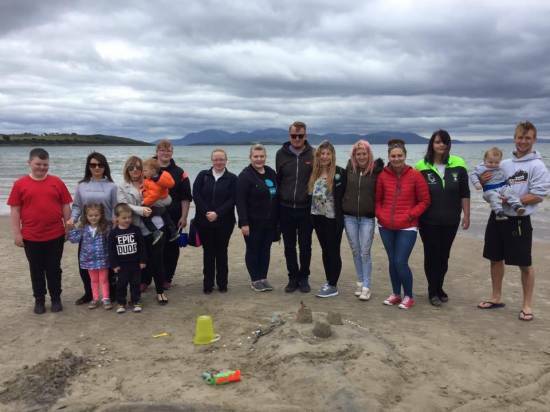 The following week we brought our young people from Dunoon and Rothesay all together for a Sandcastle competition at Ettrick Bay on Bute. We enjoyed a midweek trip to the Inveraray Highland Games which was blessed with glorious sunshine all day long as we explored the stalls and admired Scotland’s traditional take on athletics. We were less fortunate however for our day out at Ardentinny Beach as we faced unpredictable changes in the weather, however saved by our gazebo under which we enjoyed a feast fresh from the BBQ. A fantastic day out at Kelburn Country Park marked the last activity for our young people’s children, where the number of children seemed to multiply as we saw the child come out in everyone. Finally a trip to Millport rounded off our summer holiday programme in style, once again bringing our young people from Dunoon and Rothesay together for a 10 mile cycle around the Island of Cumbrae. Thanks to all of our young people who got involved and for making these days so enjoyable for everyone! !